Wide range and different design spirit levels. Here you will find Sola, Stabila, Stanley, BMI, Bosch, Milwaukee and other manufacturer levels. Convenient filtering system allows you to select mechanical, digital, magnetic, laser, water and flat levels, choose the manufacturer and the required length. 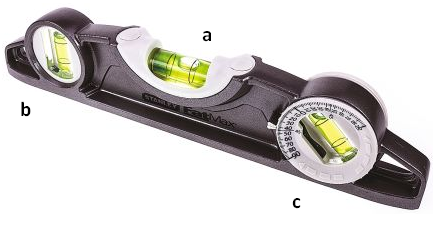 Mechanical spirit level is a classic leveling tool with a spirit eye (a) and air bubble inside. This air bubble will show the position of surface and its inclination direction. If the surface is horizontal, air bubble will be exactly in the center of the spirit eye. In most cases spirit levels have two spirit eyes for horizontal (a) and vertical (b) surface check / alignment. Some level models also have spirit eye with degree scale and possibility to turn it around (c). This rotary spirit eye is designed for checking / setting surfaces, tilted at a certain angle. Digital spirit level is a modern version of the classical mechanical spirit level. In addition to the horizontal (a) and vertical (b) spirit eyes, these levels have an electronic display (c), showing the surface slope in degrees. Such levels usually have some additional features, such as memory and an audible signal, at 0 degree position. Some digital levels also have an extra laser beam that allows you to transfer a point over a distant surface. 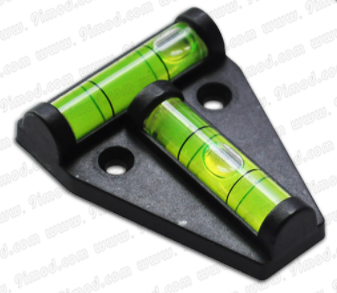 Magnetic spirit level is a version of mechanical or digital level, with magnets on one side. It is very convenient to use this type of spirit level when working with metal, because magnets hold your level on metal surface during your check or alignment process. 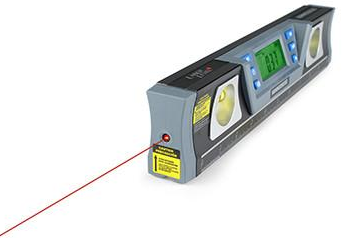 Laser level can be a mechanical or digital version of spirit level with a laser beam function or a simple laser point level. Flat level is a small flat plate with a spirit eye for horizontal leveling / checking. Some flat levels have mounting holes, so they can be attached to other tools or machines that must be positioned in a horizontal position. Water level is for determining the height of points in a big distance. Main water level component is transparent plastic hose with transparent tubes placed at its ends - indicators. Hose is filled with water. 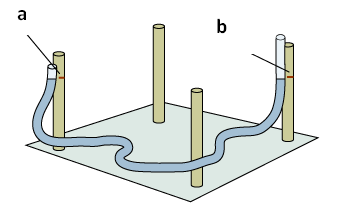 Due to the earth gravity force, the level of water is everywhere the same, so attaching both ends of hose to different points you can make marks in the same level. This type of level uses the principle of communicating vessels.